Native River and Might Bite are the odds on favourites to win the Cheltenham Gold Cup, the most anticipated Grade 1 race of the 2018 Cheltenham Festival. You can back these two horses at enhanced odds with 888sport - 33/1 Native River or 33/1 Might Bite to win . 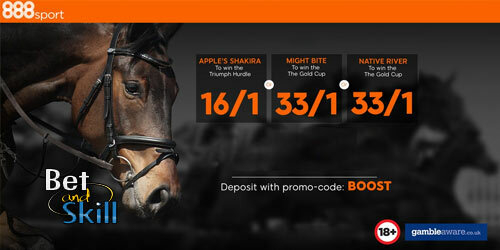 Furthermore, you can also claim 16/1 Apple's Shakira to win the Triumph Hurdle on Friday 16th March! MIGHT BITE looks to follow-up his RSA Chase win from 12 months ago. He is an unbeaten (bar the fall when he was well clear), triple Grade 1 chase winner, including the Mildmay Novices’ at Aintree. He reappeared this season with an easy victory over the now 164-rated Frodon over a trip too short and followed up with a decent enough win in the King George on Boxing Day. The big question that remains is that of his stamina. NATIVE RIVER, 3rd placed in 2017, will arrive fresher this year. Last year he ran in the Hennessy and the Welsh National and maybe that just cost him the Gold Cup. He has had just the one start since then, with an emphatic win in the Denman Chase at Newbury. 888sport offer 33/1 Native River to win the Cheltenham Gold Cup! Max bet £5! 888sport offer 33/1 Might Bite to win the Cheltenham Gold Cup! Max bet £5! Find here how to boost your Cheltenham Gold Cup profits with 888sport! 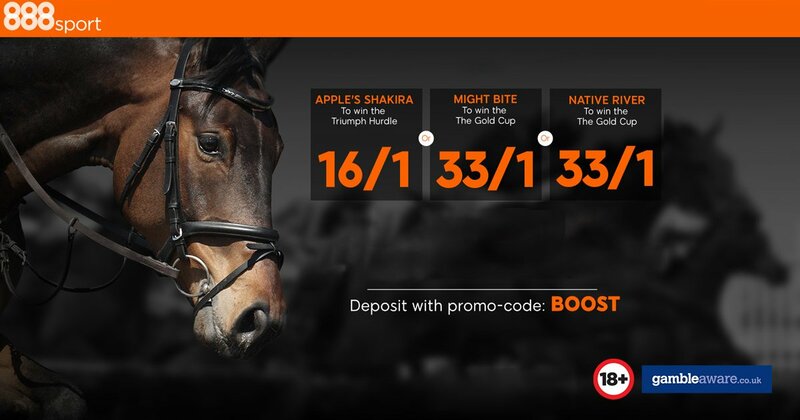 888sport offer 16/1 Apple's Shakira to win the Triumph Hurdle! Max bet £5! 4. Faller insurance! Get you money back if your horse falls, unseats or is brought down! New customers only. £10 minimum deposit using promo code BOOST. Qualifying bet must be placed at the normal odds Min bet £5, max bet £5 Extra winnings paid in FREE BETS and added within 72 hrs of qualifying bet settlement. Free bet stakes not included in bet returns. Free bets expire 7 days after credit. Promotion is valid until the advertised race start time on 16th March 2018. "Get 33/1 Might Bite or 33/1 Native River to win the Cheltenham Gold Cup at 888sport"